Gus is now 18 kg and as tall as Taz. She can still wrestle him to the ground though, he's a bit uncoordinated, but very cuddly with humans. A friend asked if Taz is helping to get all the wiggles out of Gus, but to be honest Taz has way more wiggles, Gus is just a laid back, chilled out puppy who wants cuddles and naps all the time. Taz runs circles around him and leaps on him and he doesn't know what's going on. Its funny to see their different energy levels, I thought all puppies had the wiggles until I met Gus! More about Gus here. With winter comes soups, roasts and casserole weather. Yum! My favourite is rolled roast in the slow cooker. I made the stuffing for these rolled roasts with homemade breadcrumbs, garlic and dried herbs from my garden. Our patient butcher is used to me now, he used to try to talk me into using his stuffing (preservatives and artificial flavours included). More about butcher day here. We finally invested in a post hole digger for the tractor, after years of digging by hand or using a dodgy auger (which I was never strong enough to hold up my end, so we always turned around with it). We are planning on dividing up the 100 acre paddock at Cheslyn Rise, partly because its always been too big and also to keep the cows out of the new dams until they grass over more. And then we have the house yard to build, so there will be a lot of posts and a lot of holes. We are using posts cut from trees that were in the way of the house back when we moved the house, with star pickets in between (rather than split posts). More about fencing here. We are not getting many eggs at the moment as the hens take a break over winter (more about lack of eggs in winter here). The chicks that we hatched in February are getting big, but can still fly into my garden (grrr). We've split the hens and roosters into separate chicken tractors as there were too many in the one tractor. We've had to start feeding hay as we have no grass left at Eight Acres (and too many cattle, but that's another story). We are planning to move a few to Cheslyn Rise to even it out, as we only have the nine Angus cows and eight calves and bull there now (on 258 acres!). We need to wean the calves from the dairy cows over the next few weeks, so that should be interesting (and sad, I will miss milk, but we haven't bred Molly again yet, we've been busy and want to get the timing right to suit everything else that's going on). More info about supplement feeding here and drying up a house cow here. I feel a bit disorganised in the garden. I have planted a few seeds, which are starting to pop up (asian greens, silverbeet, radishes, carrots, marigolds etc.) and pea and celery seedlings. A pesky hen keeps flying over the fence and scratching up the new mulch. There's still a few tomatoes and pumpkins to harvest and lots of kale. Its a bit of an in-between time, so I'm looking forward to getting more growing in these cooler months. This is similar to the photo from last month, but now the plastering is finished, so its just up to us to paint and buy the mirror to go over the vanity. We've ordered our hardwood floors, so we are trying to finish painting the remaining two rooms (+ bathroom) and all the doors and windows. But its such a good time to do outside work, some of the house work will have to wait. Last time I discussed Creatively use and respond to change I used the examples of generating changes to increase productivity (e.g. disturbance to improve pasture) and adapting to external changes such as climate change and limited fossil fuels. This time of year I am thinking about change in seasons. This a predictable change, but it does give us some opportunities as the days get shorted and cooler for a few months. 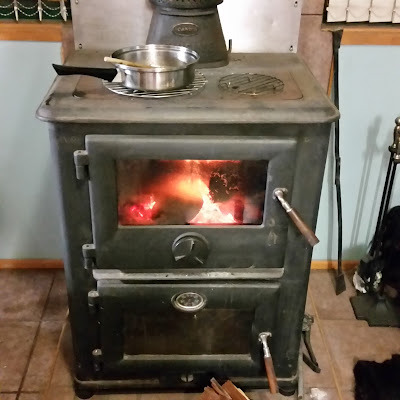 We tend to cook on the woodstove, do more outside farm work such as fencing and the frost kills off buffalo flies and garden pests, which means I can grow brassicas. Preparing and responding to this change in the season means that we can take advantage of the opportunities. I finished my first pair of crochet socks, I'll share the step by step photos with you so you can follow a long. They do look a bit funny but they are very warm and much easier to make than knitted socks once you get the hang of the pattern. I had a weird soap fail. The salt soap that I made is so hard it crumbled when we cut it. I tried to melt it down, but that didn't work great. I have some other ideas. I knew salt soap would be hard, but I didn't realise it would be so difficult to cut. The recipe I used was for pouring into individual moulds. Now I have read more I found out that most people cut the soap when its still warm if they are using a long mould. I left mine for a few days, so there was no hope of cutting it! I am going to try remelting again. I really don't like to waste it, and I want to try the soap! I also wanted to tell you about the Nanango Home Produce Share. I friend of mine had the great idea to start a monthly gathering where locals could share excess from our gardens and homes. If anyone in the South Burnett is interested, please join our facebook group, or come along to our next gathering. The second Nanango Home Produce Share will be on at Ringsfield House on Sunday the 19th of June. The gathering will start at 9:00am and sharing will commence from 9:30am, wrapping up about 10:30am. The share takes place near the Couch House in the gardens. Remember it is not only fruit and veg that we share, we also have a space for items that are not for human consumption. Bring along your excess to circulate among like minded people and receive some great goodies in return. That's all from me for May 2016! What did you get up to? What's your plans for June?